Certainly best known for the amazing cocktails, Proof and Pantry also has this fantastic dining menu that is power packed with large plates that are ideal for sharing. From the massive Strube Farm Long Bone Ribeye that is suggested to feed three or four adults, to the Whole Fish that will easily satisfy a couple, the menu is a fun read for those looking for something a bit out of the mundane. 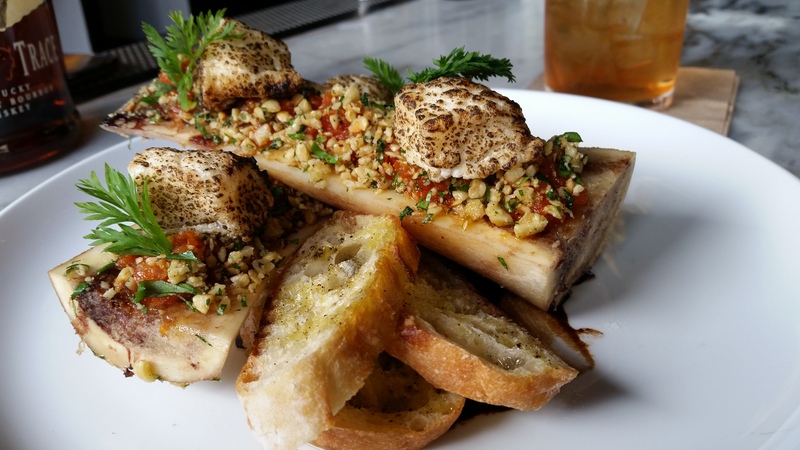 There certainly is no shortage of bone marrow dishes, and that is a good thing. The Proof and Pantry version comes adorned with house-made onion marshmallows, tomato jam and a spicy gremolata. This is one dish that you could share, but probably want to keep elbows high in protection mode. This would be delicious with a tall flute of something sparkling, or a high octane Old Fashioned. Finish off the repast with strawberries with brûléed lemon curd, buttermilk whipped cream. Sounds like we have are evening planned.